Willis Engineering and Surveying offers a wide variety of professional services for both residential homeowners and commercial businesses in Columbus, Ohio and its surrounding areas. Land surveying determines property boundaries by surveyors searching for previous boundaries in existing survey records, land titles and deeds. However, if none exist, they will conduct fieldwork, with a team of technicians and prepare new plans to determine the accurate boundaries of a specific project area. Their job involves technologically advanced methods of land study including land mapping, navigation and communications. They begin a survey by conducting extensive historical and legal research and performing mathematical calculations. In surveying tests, land surveyors use instruments that automatically record land depth, slope, distance, contours and other important data that will determine boundaries and building regulations. The information that land surveyors gather is used to determine rights-of-way for utilities, road and highway alignments, marking limits and boundaries, well-site locations, mining claims for resource development, subdivisions of land, and the location of houses and buildings for construction or sale. Land surveyors are often consulted when there is a civil or commercial dispute over property lines and may be called upon to testify in a court hearing. When land surveyors have completed their research and land survey studies, they usually prepare a detailed written report, which may include contour maps and plot maps. 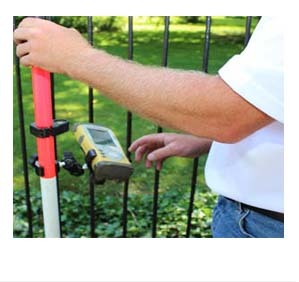 Having your property surveyed by a professional land surveyor can give you peace of mind that you are covered by having the exact boundaries of your property.